ADAMED SmartUP: the first edition scholarship recipients announced! Soon the extraordinary scientific plans of the first edition ADAMED SmartUP programme winners – Aleksandra Janowska, Michał Bączyk and Maksymilian Głowacki – will become reality. Each of them received a scholarship from the Adamed Group Foundation for PLN 40,000, for higher education and further scientific development. The winners emphasised that the money would be spent on acquiring knowledge and carrying out their own research. 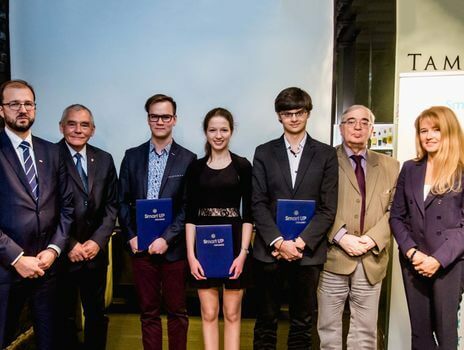 The scholarship recipients were announced on 20th December this year during a ceremony, which, besides the winners and their families, was attended by the Undersecretary of State for the Ministry of Science and Higher Education – Dr. Piotr Dardziński, and representatives from the ADAMED SmartUP Programme’s Scientific Council and the Adamed Group Foundation. Aleksandra and Maksymilian come from Warsaw and Michał comes from Ostrów Mazowiecka. All recipients are winners of both Polish and international competitions and Olympiads in natural sciences. In 2014 they took part in the first edition of the ADAMED SmartUP scientific and educational programme. All three made it through the elimination rounds to the innovative scientific camp, and were later among the competition’s ten main prize winners. As part of scientific consultations, Aleksandra Janowska received support during her preparation for the Biological Olympiad, both for the nationwide and international competitions. Maksymilian Głowacki took part in chemistry, physics, Polish and English classes as well as in a scientific workshop at CERN – the European Organisation for Nuclear Research. Experts collaborating with the Adamed Group Foundation have also helped him to apply to study at the University of Cambridge. Michał Bączyk received similar support. This support enabled him to participate in the Oxbridge Preparation Weekend in England. Additionally, Michał has attended mathematics and English classes and received help in preparing for the Sixth Term Examination Paper (STEP). ADAMED SmartUP has changed my life, I made lots of new friends, and I was also motivated to study more, to improve and find new ways to fulfil my dreams. I am passionate about biology, so most of the classes, which I attended as part of the scientific consultations, were connected with this subject. The mentoring support enabled me to win a bronze medal at the international Biological Olympiad in Hanoi, Vietnam. I will use this science scholarship to further broaden my knowledge – says Aleksandra Janowska, ADAMED SmartUP programme scholarship recipient. The third edition of the ADAMED SmartUP programme is under way. All pupils between the ages of 15 and 19 can register on www.adamedsmartup.pl until 15th January 2017. If you want to get a chance to invest in your future, like Maksymilian, Michał and Aleksandra, register today!